Jim Weinberg – celebrity designer of Liveable Lifestyles was commissioned to design the Aqua Building residences. CellarMaker was asked to join the Liveable Lifestyles team to create a modern take on a wine cellar. 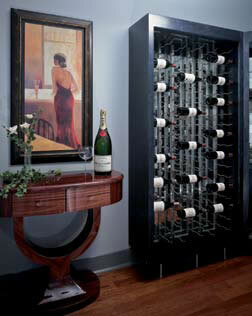 The brushed nickel label forward Vintage View Wine rack systems were used in the wine case. The back of the cases incorporated mirrors to add depth to the shallow room. 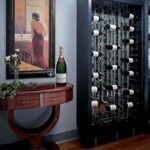 This cabinet also includes a tasting bar made out of exotic granite.